'Be a MAN in the City Watch! The City Watch needs MEN!' 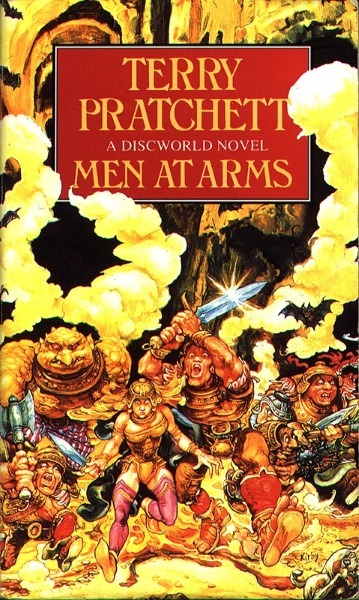 But what it's got includes Corporal Carrot (technically a dwarf), Lance-constable Cuddy (really a dwarf), Lance-constable Detritus (a troll), Lance-constable Angua (a woman...most of the time) and Corporal Nobbs (disqualified from the human race for shoving). And they need all the help they can get. Because there's evil in the air and murder afoot and something very nasty in the streets. It'd help if it could all be sorted out by noon, because that's when Captain Vimes is officially retiring, handing in his badge and getting married. And since this is Ankh-Morpork, noon promises to be not just high, but stinking.